Need a legal form fast? Access thousands of legal forms frequently used by Massachusetts attorneys. Stop wasting time scouring court websites or reaching out to authorities for the most up-to-date Uniform Counsel Certification Form. See how LEAP helps attorneys save time and make more money. 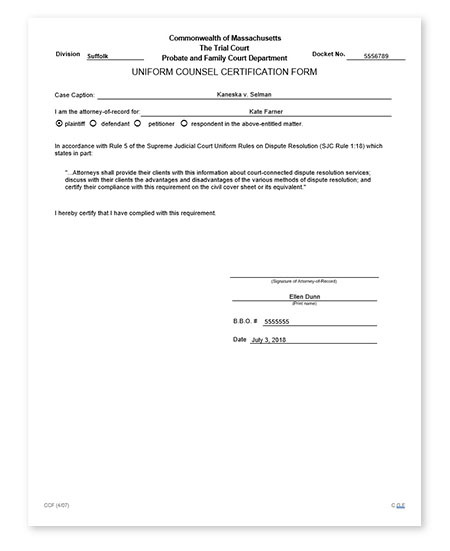 The Uniform Counsel Certification Form is filed by a party’s counsel to confirm that they have complied with the statutory duty to discuss with the client the advantages and disadvantages of various methods of dispute resolution. "LEAP is adaptive. LEAP provides legal forms for my areas of practice. I can also import my own forms. It allows me to do what I am comfortable with at a much faster pace." Want access to up-to-date legal forms in your state? Need a legal form fast? Access thousands of legal forms frequently used by Massachusetts attorneys. See how LEAP form automation helps attorneys save time and make more money!